Oh, how important it is to fill our day with good things. I make the same mistake almost daily of letting my day run me instead of running my day. Even after 15 years of homeschool experience it’s still so easy to get pulled this way and that. 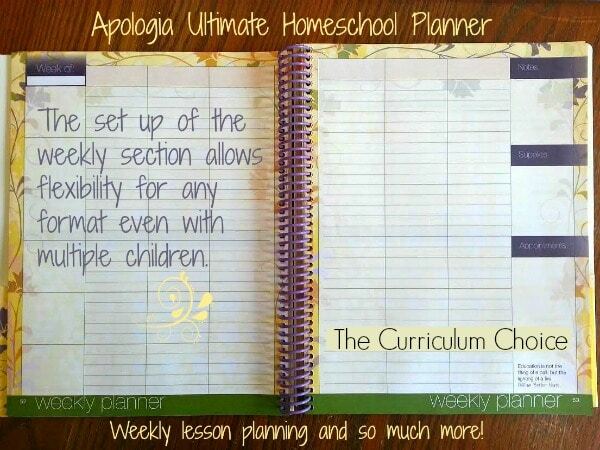 This year I am very thrilled to have the Ultimate Homeschool Planner from Apologia to aid me in staying the course and to encouraging me along the way. Now that you have found and bought the best homeschool program at the best possible price it’s time to get started. The thing is, the curriculum and setting up the homeschool room are the easy part. What’s difficult is the day in and day out application. We need prayer, God’s grace and wisdom to bring our homeschool visions to reality. How do we do it effectively? Is there a way to manage it all? The real truth about homeschooling is that we won’t be able to do everything that is worthy and certainly not everything we plan. We may have the best intentions and even the perfect plan but along the way life will happen and throw us off course. So instead of being a slave to your planner get one that takes this truth into consideration! Those three things are so important for ensuring your success and that you don’t get discouraged and burnt out. Homeschooling is hard and there are plenty of plain bad homeschool days. You need a planner that offers extra space for evidence of God’s grace, a weekly battle plan and counting your blessings. 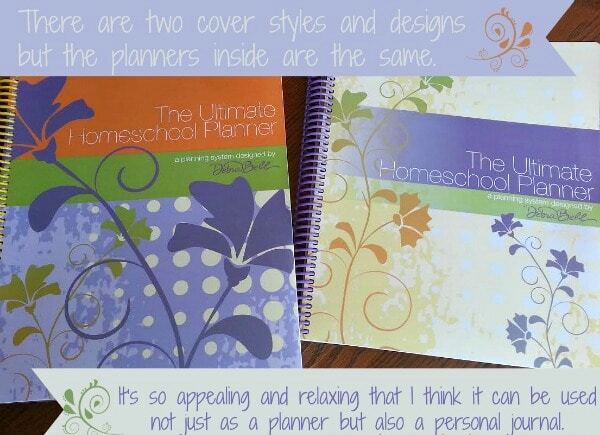 The Ultimate Homeschool Planner doesn’t just get you organized, it teaches you how to homeschool! The statement above is true. This planner is basic homeschool mom training as well as a journal of reflections and this sets it apart from other planners. Most of us start out with reliance on a boxed curriculum and while that teaches us what we want and don’t want out of homeschooling it doesn’t give us the skills we need for effective homeschool management. This planner does just that and guides the parent in a holistic way. Homeschooling is about education, and sure- curriculum too. But it’s even more about life, love and preparing our children for their future and eternity. Reviewing each month’s plan and revising as needed. Cultivating thankfulness for God’s work in our lives. Committing our plan to God with total submission and reliance. Monday morning tutorials one on one with each child: set weekly assignments for each child teaching to independence, offers time to help with your child’s time management strategies, and time to pray with your children individually. Friday afternoon weekly reviews with each child: provides accountability and offers time for feedback or grading for the week’s assignments. Pocket folders on the outside cover– great for storing anything needed during planning time. At a glance 4 year calendar– Great for referencing future dates. One Year Planning Grid– First thing to do is to get a feel for the year ahead and its special events and commitments. Student Goal Setter– Space for writing student goals, both character and academic. 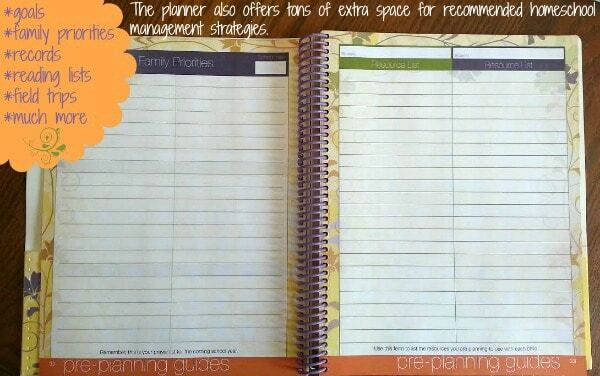 Pre-Planning Guides– Space for writing you/your husband’s family priorities out for the year. Plenty of space for adapting as time goes on. Monthly “At a Glance” Planner– you will use this section when looking ahead and planning each month during the monthly planning time. It gives you a glance at the month ahead to make accommodations in your plan. 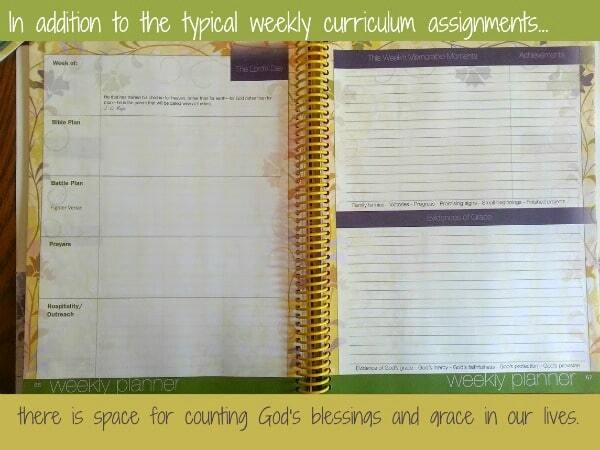 Weekly Planner– Offers tons of room for multiple children, this is the main area you’ll use weekly to write in assignments and notes. You may also journal in this spot, space for evidences of grace and your weekly battle plan. Records: Grades, Reading Lists, & Activities- a place to record all that you are doing for and with each child. Teaching Tips– A very helpful section on personality types and learning styles and how to teach them. High School Planning Guide– Looking ahead for your high school age children will aid you in meeting needs and preparing them for the course ahead. – it’s comes so quickly! Year in Review-Gives closure for the year, this is a place to write what you’ve accomplished for each child. Scripture passages and quotations on every page– Can’t say enough about these. 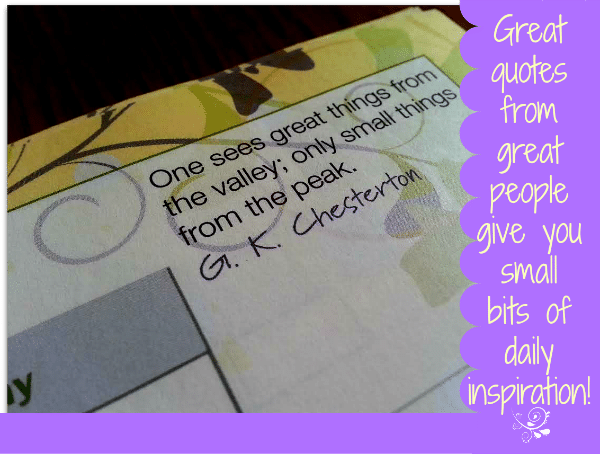 They are throughout the planner and offer small bits of encouragement and reflection for the day or week. There are two different color schemes/cover designs that Apologia offers for this planner. But just so you know, they are the same inside so when you choose a color it’s only difference will be what you see on the outside. The inside is so beautifully done that it can easily double and a prayer journal for mom. A wonderful tool for large families. I only have one child I am currently homeschooling but was so impressed with the care and concern given by this planner to meeting the needs of families with multiple children. The planner details how mom can prioritize according to each child’s needs and then integrate that into a management picture so that every child has the individual time needed for guidance from mom. I was very impressed with such a comprehensive approach for veteran homeschool moms whose families have grown. There is also adequate space in the weekly plan section for large families- squares for up to 6 children being homeschooled at any given time. Even if a mom had more than that to teach it could be easily adapted by dividing squares between younger children. You can write things in the way you wish as much of the set up can be to your preference. 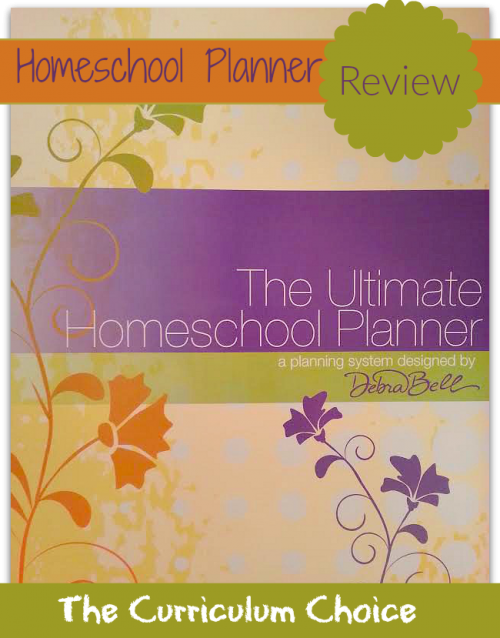 How much time does the Ultimate Homeschool Planner recommend for planning? One of the things I really enjoyed about the planner was it’s mega positive approach that is encouraging while remaining realistic– not overwhelming. It gently guides you through several planning stages: the retreat ( 4-8 hrs. yearly), monthly planning sessions (2 hrs. monthly), weekly planning breaks (30 min. ), Monday Morning tutorials( 20 min. per child) and Friday after noon weekly reviews ( 15 min. per child). What a recipe for success! 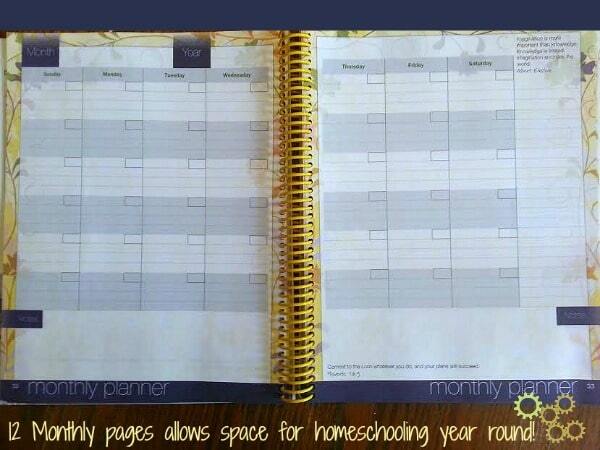 The Ultimate Homeschool Planner keeps grace in mind. Confession: My house is not always so clean. That’s probably not hard to believe at all. *chuckle* Even though I clean a lot. It’s a never ending job. In all honesty, laundry gets behind and sometimes beds don’t get made. Okay, often they don’t get made. I generally struggle to find balance between housework, blogging and homeschooling on a regular basis. But through it all are the moments that really matter. And I have loved the way that I can pull this planner out in the morning, just before we begin the day, and despite that some days I feel overwhelmed, it calls me back to what’s really important. Only a planner written with grace in mind can do that. And that’s the real power behind this planner. 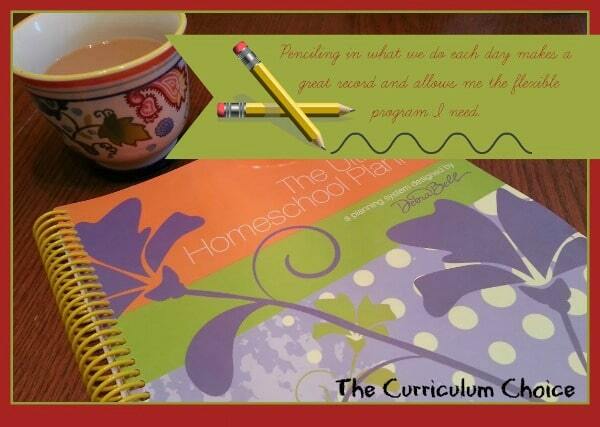 I have had so many different homeschool plans and planners over the years. I’ve learned to be flexible. And even though homeschooling is not any easier for me now than it has been in the past, because life is like that, at least now I know that I need to be adaptable. So I urge you not to be too hard on yourself if you are finding you have to make numerous adjustments to your plan, it’s just part of how God molds us. It took me a long time to accept that. I’m so very happy to say that this planner takes all of that into consideration and has a very realistic approach. But even so, I still use pencil! You can purchase this planner from Apologia for $28.00. As thorough as these planners are I believe they truly are worth it. They have thought of every aspect of planning and more and have extra space built in that can be used in many ways. Did the planner include areas where you could record grades? I’d love to find something that has it all in one location. Planning and grades and goals. Everything about this planner looks great, but I saw no mention of that one thing.